Stainless steel wall mounted combined sluice sink (slop hopper) with sink and plain top. Complies with the requirements of HBN 00-10 Part C: Sanitaryware Assemblies which replaces the old HTM64 specification. DU HS Hospital disposal unit. 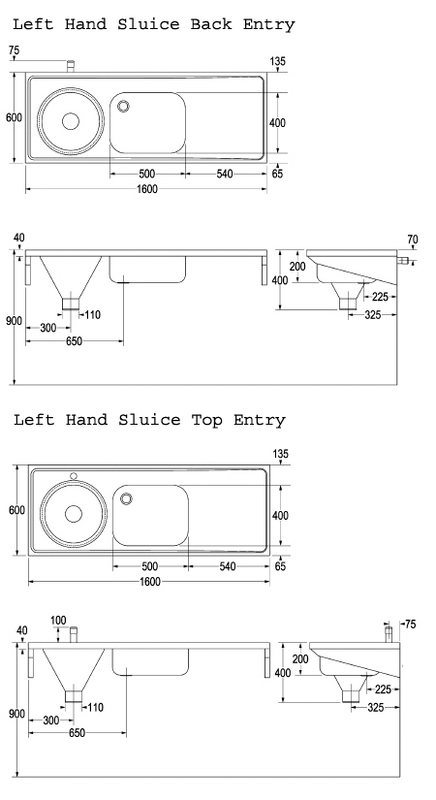 Left hand sluice, centre bowl, and right hand plain top, also available with right hand sluice. Manufactured from grade 304 stainless steel with a satin polish finish. The combined slop hopper is manufactured with an anti drip edge and turn down to all four sides. Complete with wall mounting brackets with the option of front support legs. Overall size 1600mm x 600mm. Available from stock with back entry flushpipe connection for a concealed cistern or top entry for an exposed cistern. Top entry models come complete with a stainless steel downpipe. Full flushing rim to ensure efficient and hygienic flushing. 110mm plain spigot outlet with the option of white polypropylene P or S traps. 500mm x 400mm x 200mm stainless steel sink bowl. 38mm unslotted flush grated waste fitting, no overflow. Supplied as standard with no tap holes, but can be supplied with one central or two tap holes either 22mm, 28mm or 35mm diameter. The combined sluice sink can be supplied with a stainless steel manual cistern with operating lever or a plastic concealed / exposed cistern and flushpipe with operating lever. In stock standard delivery time usually 3 to 5 working days. To see the full range of sluice sinks and hospital equipment. From stock usually 3 to 4 working days.